How Much Dividend Income Do We Earn in a Day? Do you track your dividend income results each month? As an investor, one of my favorite activities is to track and report our dividend income earnings at the end of every month. It is a way to stay motivated building our portfolio month by month. In addition to tracking our monthly results, we also report our annual dividend income at the end of every year. We have actually been tracking our annual results for the past 6 years. Well now … I have decided to start keeping track of our daily dividend income! Sounds crazy I know, but it isn’t that bad or time consuming. I am not going to track each specific day, but rather an average amount of dividend income earned over the course of a year (or 365 days). Below you will find a look back at the past 6 years of our annual dividend income as well as daily averages. Here is a look back at our annual dividend income results for the past 6 years (2011 – 2016). As you can tell from our results, each year we have seen steady growth from our dividend income. We plan to continue that trend by earning $2,400 in 2017 and over $3,000 in 2018! As each year passes, we expect for our earnings to accelerate even more as the compounding interest builds momentum. When talking about personal finances, I like to break things down into simple terms. 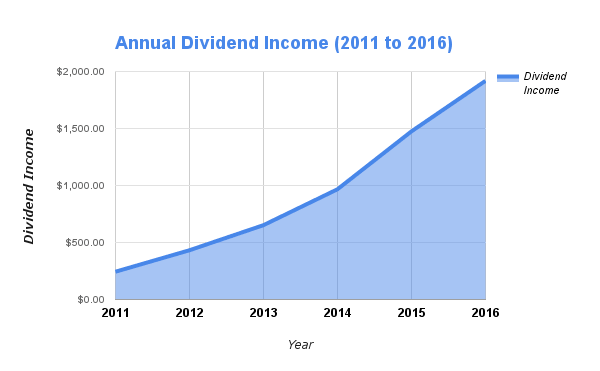 One thing I plan to start tracking this year is the average dividend income we are earning per day. This is no different than reporting our annual dividend income, but it breaks our earnings down into something we can relate to. For example, it is a cool feeling knowing that last year (2016), we were earning an extra $5.26 per day in income from our stocks. The even cooler part of this is that most of these earnings were done with almost no hours spent on our part. Sure … there is the time I spend tracking our results and researching new stocks. But for the most part … I am not spending any of my time on stocks we already own. Using the annual dividend results (shown earlier), here are the average daily results for the past 6 years. Note – I took the daily average by using a 365 day calendar. The good news is that if we are able to hit our dividend income goals for this year (2017), we would earn an average of $6.58 per day! This is based on an estimated $2,400 in dividend income. Tracking your daily dividend income allows you to easily compare it to other side income sources. For example, I recently logged into our Google Adsense account and discovered we had earned $1.20 the day prior. These earnings were a result of ads displayed on one of my websites. While the income isn’t all that much, it gave me a little extra motivation knowing that there is the potential to earn income from this niche site. But when I compare that $1.20 earned in ad income to our daily dividend income of $5.26 from last year … I realize we still have lots of work to put in. As we start to bring on new sustainable income streams this year and future years to come … I plan to start tracking our average daily earnings per source. This will make it easier to track and compare our most successful sources of side income and those that need work. Do you track the daily average of any of your side income sources? What about your dividend income?